James Haskell and Ken Pisi are in line to make their return from injury against Leicester Tigers on Saturday. Haskell has been sidelined since November after having ankle surgery, while Samoan wing Pisi has not played since September due to a shoulder problem. But both players are now back in full training and could get some game time in the Premiership Rugby Cup clash at Franklin's Gardens. 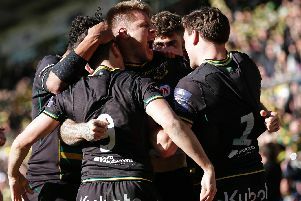 Saints currently sit top of Pool C, knowing a bonus-point win will guarantee a semi-final spot. And boss Chris Boyd provided plenty of positive team news at Tuesday's media session. "Ken Pisi will come back this week," Boyd said. "Like Nafi Tuitavake (who made a try-scoring return last Friday against Timisoara), those guys have had long spells out after needing surgery and they'll both feature at the weekend. "I'm looking forward to seeing how they go." And on flanker Haskell, Boyd said: "James actually could have played last week but we thought another week of rehab for him after his ankle operation was best for him and that's what the medical people told us. "He's certainly in consideration for this week." More good news comes in the form of lock James Craig, who has been so unlucky with injuries. Craig, who has been sidelined with concussion, was forced off after just coming on for his first appearance of the season against Bristol Bears in October. But he could soon be back in action. "We've just come from training and he had a really good session today," Boyd said. "I told him he looked like he belonged again, and he certainly does. "He got right in the thick of it, it was physical in parts of the training session and he certainly didn't shy away from that. "He's not far away from being confident enough to get on to a teamsheet."